I originally starting writing a post of epic proportions, laying out everything I’ve done and even just thought about doing over the last two months… it got a little ridiculous. Instead, I will break it up into a little bit of a series so that I can not only tell you what I did, but also why I chose to tackle the project during the summer months. One hundred degree weather doesn’t normally send people running for wool and hand knits. Yet, in the past two months I have completed five projects, spun two pounds of wool, and currently have six more works in progress. So, how is it that I’ve stayed so motivated? Other knitters and spinners. It all started with TheKnitGrllls “Stash Dash” running June 3rd to August 12th. First, everyone participating set individual goals for how many grams of stash we would use over the course of the event, including any WIPs (works-in-progress). Since this is not the first season of this event, I watched some group members post goals way beyond my comprehension. After careful thought and consideration, based on the summer events to come, I set a goal of 1,800 grams. I pulled out the yarn and fiber, photographed it all, and assigned it to projects and dates to start and complete each project, keeping in mind my progress in other projects to make sure I wasn’t being overly ambitious. 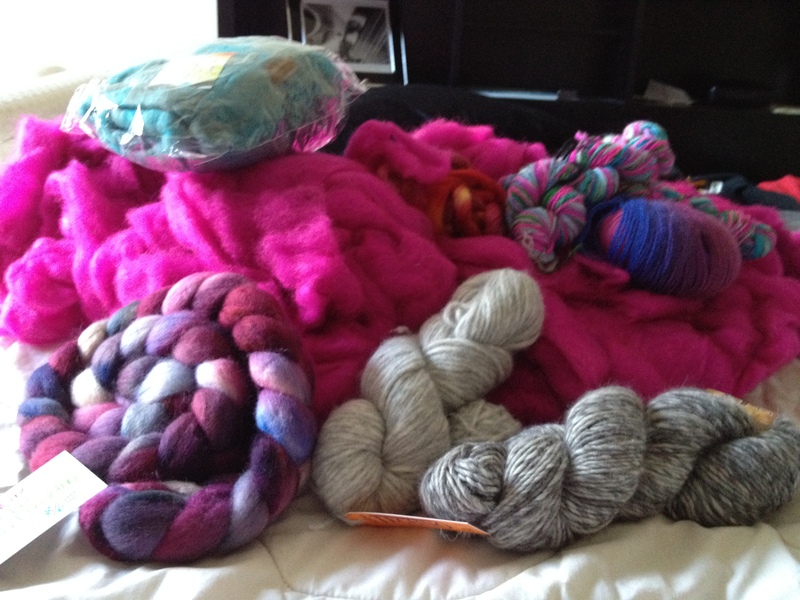 Stash Dash 2012 goal – 1,800 grams of knitting and spinning fun! 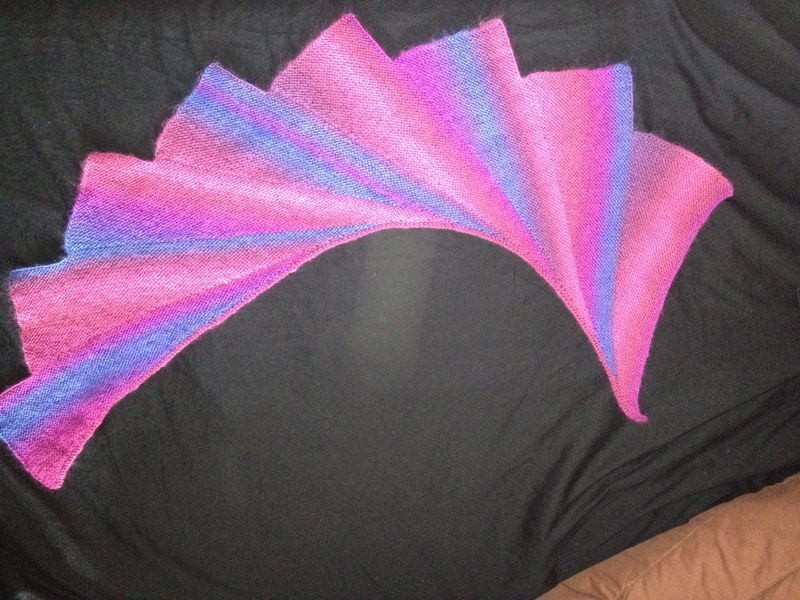 During the first few weeks, I completed my Shaelyn Shawl, Wingspan and a cotton dress for M.
The first project was obvious, as I had been working away at it for some time, but had simply run out of yarn at the very end. 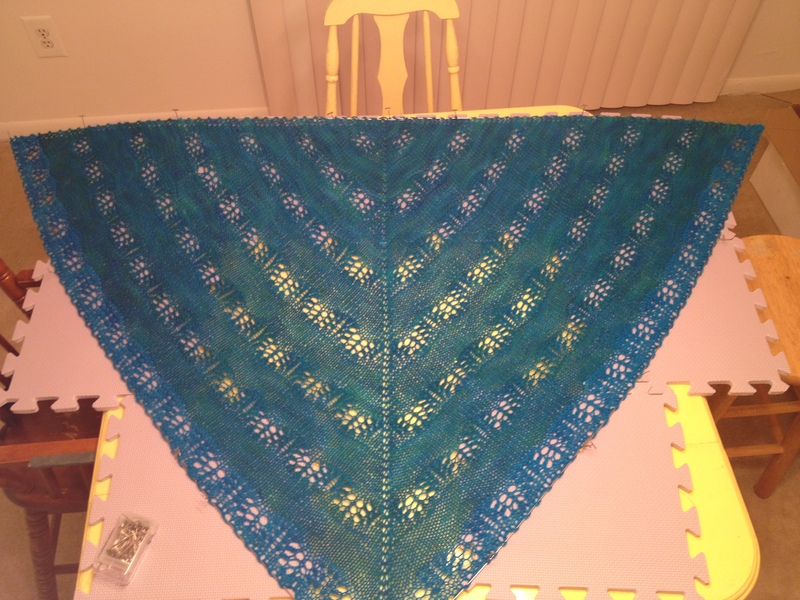 I was knitting the Shaelyn Shawl out of Sweet Georgia Yarns in a very summery teal color that was heavy enough to keep me warm, while the shawl was at a loose enough gauge that it is still breezy enough to be worn during the summer. I decided to pick up more Sweet Georgia in a lighter and truer blue colorway to work the final edge pattern repeat and castoff. Not only was it a quick finish, but I’ve gotten some wear out of it at work, where the temperature constantly fluctuates throughout the day. Shaelyn by Leila Raabe knit in Sweet Georgia Superwash Sport in the Tourmaline (main) colorway and the Saltwater (edging) colorway. I chose the Wingspan next because I had been trying to find the perfect pattern to use some of my Mini Mochi yarn from Crystal Palace that I had been obsessing over. Though it’s a single ply, it’s definitely very fluffy and warm and I only had two balls in the colorway, so I knew I wanted it to be a fairly small project. Plus, I wanted it to be portable to knit at work and be a simple enough pattern to knit through very quickly. I haven’t had the chance to wear it out yet, but it was such an enjoyable knit and the summer heat didn’t slow me down one bit. As for the cotton dress… sigh. I had been promising M, and my mother, a cotton dress for M for the summer. I had originally intended it to be finished for her to wear to Maryland Sheep and Wool in May.. but never got past the cast on. I love the end result. I even taught myself to do a double crochet edging around the armholes and neckline. I didn’t even really mind the feel of the cotton. 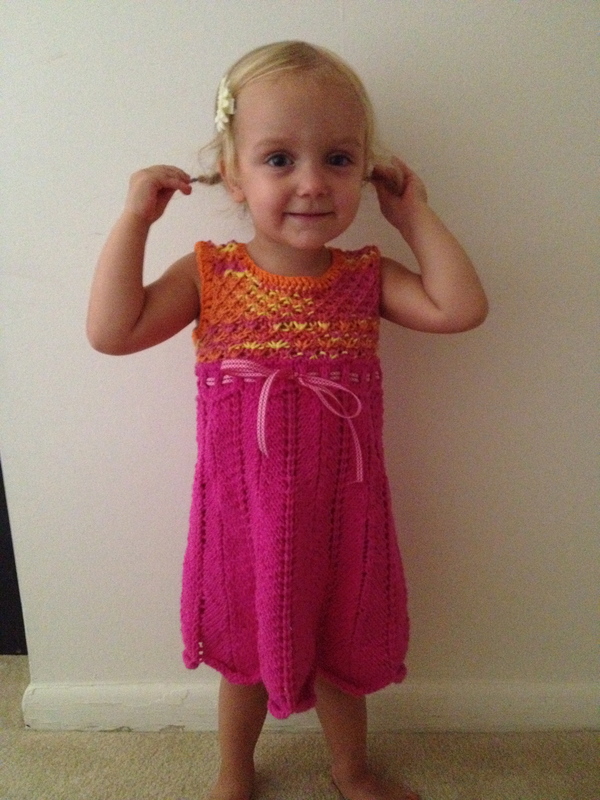 But my hands we screaming at my every time I knit on this dress for more than ten minutes a day. Not a sitting, A DAY. I had knit cotton before.. but it was Knit Picks Shine in a Pima cotton. I know that Pima cotton is softer and just better, but I had found so many wonderful, bright and cheerful color combinations in the Sugar and Cream (dishcloth) cotton that I knew would be perfect for M. The pluses: the pattern is lovely and I felt completely comfortable knitting this poolside as I knew this dress would also get wet and have sunscreen all over it whenever M would wear it. Cotton a big plus for summer knitting… just maybe real garment cotton for big projects. The rest of my summer knitting was planned out to the extreme. List after list was made to ensure that everything could and would be completed on time. Of course I totally stayed on schedule…….